Isn’t he cute?! I imagine he gets into a lot of trouble trying to become friends with humans. 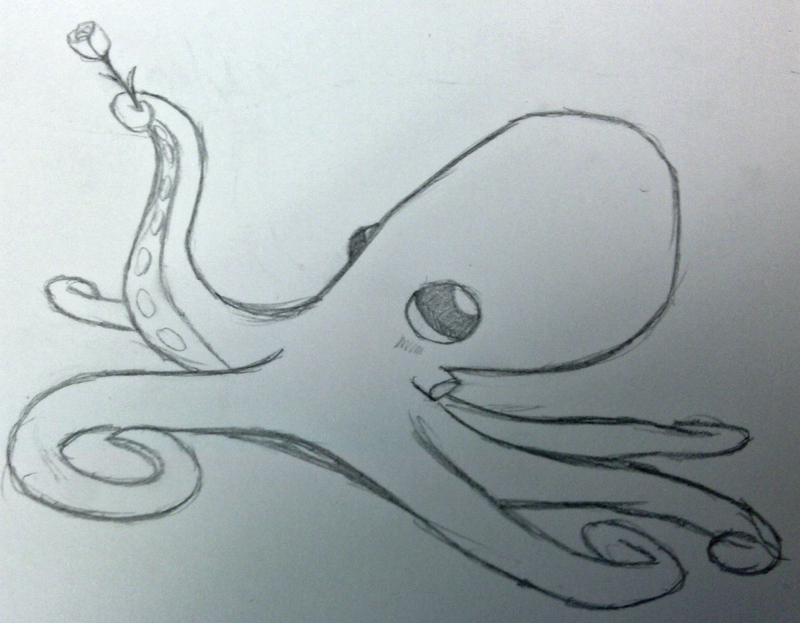 I mean, cephalopods, especially octopi, are the smartest invertebrates we know. Why couldn’t there be a friendship between humans and an octopus? I think Brain Kesinger created a series about such a friendship (A.K.A. Otto and Victoria). I will probably ink him and post this drawing finished later today or tomorrow. What is your favorite aquatic animal? Such a cute drawing! I went to the aquarium here last summer and they have an octopus who plays with lego. I couldn’t believe how intelligent they are. They put his food in a closed lid container and he unscrews it himself to get his grub. Then the guide was telling us about an aquarium where the octopus tank was beside a crab pool. The staff started to notice crabs disappearing every night and it turned out on cctv that he was getting out of his tank and going across to the crabs every night. Amazing that they can fit into/through pretty much anything! That would have been so cool to have seen! They are probably one of my favorite sea creatures, right beside manatees and sea turtles.